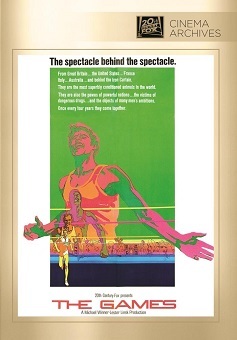 Just as John Frankenheimer’s Grand Prix took an international sports event and used it as a basis to explore the psyches of a cross-section of different competitors with individual motives, drives, and problems, so Michael Winner’s The Games does the same for the Olympics, specifically one of the event’s blue ribbon attractions – the marathon. Plot: Four marathon runners (one from England, one from the U.S., a Czech and an Australian Aborigine) prepare to run in the Olympic games. The film follows each one and shows what their motivations are for running in the games. Just as John Frankenheimer’s Grand Prix took an international sports event and used it as a basis to explore the psyches of a cross-section of different competitors with individual motives, drives, and problems, so Michael Winner’s The Games does the same for the Olympics, specifically one of the event’s blue ribbon attractions – the marathon. But the film’s script replaces character depth with surface flash and seems very naïve in terms of the training methods for one of the sports world’s most grueling events. In four different countries, men are finding paths to greatness through their abilities to run. In England, milkman Harry Hayes (Michael Crawford) is trained by former great Bill Oliver (Stanley Baker) and soon finds himself breaking a long-standing world record in the six-mile run. Czech runner Pavel Vendek (Charles Aznavour) has no problem with someone breaking his old record, but his government insists the retired forty-one year old runner get back in training to represent the country in the Olympics, especially after he surprisingly beats Hayes in a pre-Olympics race. Harvard runner Scott Reynolds (Ryan O’Neal) is BMOC, but with his heavy partying and woman chasing, he finds the stamina he needs in the speed being fed to him by his pal Richie Robinson (Sam Elliott). Australian con man Jim Harcourt (Jeremy Kemp) discovers an aboriginal man who can run like the wind, Sunny Pintubi (Athol Compton), and begins making a healthy living off his unusual abilities by betting in beach racing. The four meet to race for the first time at the Rome Olympics where the twenty-six mile race brings the Games to a close. Adapted from the novel by Hugh Atkinson with a screenplay by Erich Segal, himself a runner of note, The Games should have been far better than it is. The characterizations are all surface thin and undistinguished (rampant ego is at the heart of two of the four stories), and Segal, who should know better, has Crawford’s Hayes being entered in the marathon once he gets to the Olympics (as if placements wouldn’t have been determined before heading off to Rome and as if training for such a demanding race is no different than training for the shorter distances which he had run during the film’s preceding eighty minutes). What’s more, Segal awkwardly shoehorns into the screenplay a Black Power protest subplot (obviously spurred by events in the 1968 Olympics in Mexico City) which tries unsuccessfully to involve the film’s only black main character Sunny Pintubi. Like Grand Prix before it and The Competition (similarly composed but with an international piano competition as the focal point) which would follow a decade later, the eventual winner is probably not the one a viewer might first suspect though enough clues are dropped about the weather conditions in the film’s final quarter hour when the marathon is run that the winner shouldn’t be a huge surprise. Michael Winner directs all of the various races during the movie with an eye toward drama, and he keeps the camera close to the participants to show the viewer precisely how exacting long distance running is, though his continual use of actors speaking directly to the camera becomes off-putting after a while. Michael Crawford is top-billed as the most naïve of the runners, an odd-looking duck who gets his first taste of fame with its roaring crowds and adoring women and decides he likes it, and he certainly gives the strongest account of the toll these exhausting races take on the participants. Ryan O’Neal plays another of Segal’s Adonises (as he would do the same year in Love Story) whose movie star looks and smooth way with the ladies is legendary at Harvard though he does come off as the biggest jerk of the four leads complaining non-stop during the Opening Ceremony. Charles Aznavour gives the closest to an involving performance as the famous runner who hates running and most reluctantly takes up the sport again. A subplot about his possible defection, another Segal misfire, goes nowhere, but the singer-actor underplays the role convincingly. Athol Compton as the underrated Sunny Pintubi is appealing in an underwritten role. On the sidelines cheering on their favorites are Stanley Baker (whose anger and hostility toward his runner give all coaches a bad name), Elaine Taylor as Hayes’ girl friend Christine, Jeremy Kemp as the entrepreneur Jim Harcourt, Sam Elliott as the smiling devil offering his friend drug-fueled help, and Mona Washbourne as Hayes’ proud mother. Rafer Johnson, who won the 1960 Rome Olympics gold medal in the decathlon, is decidedly wooden as a TV commentator of the marathon. Filmed in Panavision, the opening sequence with the main titles and the closing credits give us a brief glimpse at Michael Winner’s 2.35:1 widescreen compositions. Of course, most of the film is another of Fox’s abominable pan-and-scan 1.33:1 atrocities which mangles focus throughout and destroys the film’s attempts to present this taxing track event in anything worthy of its expansive underpinnings. Color appears a little faded and dated though flesh tones come close to natural in some shots. There is a fair amount of age-related dust and dirt, however. The movie has been divided into chapters every ten minutes so this movie has 10 chapters. The Dolby Digital 2.0 mono sound mix is decoded by Dolby Prologic into the center channel. Though volume levels are a little extreme and necessitate adjustment to prevent distortion, the dialogue, sound effects (rather weak during the Olympic ceremonies onward), and Francis Lai’s score blend nicely together into a unified whole. There is a bit of slight hiss to be heard in the quieter moments of the film, but there are no age-related problems with crackle, flutter, or pops on the soundtrack. There are no bonus features contained on this made-on-demand disc. The drama may be only skin deep in The Games, but fans of the stars or of marathon running will likely be extremely disappointed in Fox’s last century approach to bringing this widescreen film to a 21st century viewing public. Matt, you are being very generous with your video rating. A pan-and-scan abomination should receive an automatic rating of zero, imo, in order to send a clear message that this is totally unacceptable.